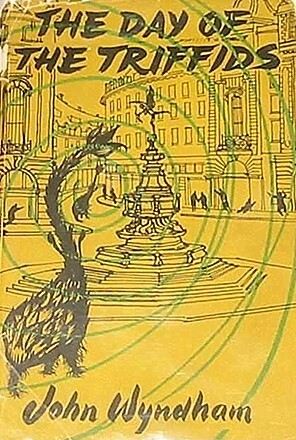 First published in 1951, John Wyndham’s Day of the Triffids is one of those books which lives up to its reputation. The plot is quite simple: a new species of plant has been created inside Russia (we are never told how). The plant can grow to ten feet in height and thrives in just about every environment. Its primary use is in the production of high-grade industrial lubricants, but it has many other uses as well. However the plant, known as a “triffid”, has the ability to walk for short distances at low speed. And they are deadly: each Triffid comes equipped with a ten foot stinging lash which can kill. The plants are also carnivorous. Since they breed so readily and produce such useful items, the plant begins to appear all over the world. Some people even keep them tethered and docked in their garden. One night the earth enters a meteorite field which lights up the sky with a brilliant glow. All over the word people walk out of doors to witness the bight display. A party mood prevails. And the next morning, when everyone who has watched the celestial light display wakens, they are totally blind. Now humanity is in chaos and has lost the one advantage it has against the triffids. The narrator of the novel is William Mason, a man who has made his living working with triffids. When the catastrophe struck, he’d been in the hospital with bandaged eyes from a near-miss by a triffid lash. The bandages on his eyes prevent him from seeing the meteorite display. Thus, when he wakes up the next morning, he’s one of the few people left with vision. Since this was supposed to be the day his bandages were removed anyway, Mason pulls them off, when no one at the hospital answers his call for help. He staggers into a word gone mad. Sightless people are groping around everywhere, desperate for help and food. Mason eventually rescues a women named Josella Playton and together they locate the last few people in London who still posses vision. Part of the book is a debate over triage: how do you decide who is to live when food and medical supplies are running out and help is not on the way. Maser and Josella become separated early in the novel. He spends most of it trying to find out where she’s gone. Along the way he rescues a four-year-old girl named Susan from a triffid attack and takes her along. Eventually he’s reunited with Josella and they decide to hold up in a remote farm house with several other people who survived the downfall of civilization. They are forced to learn how to farm since supplies are becoming harder and harder to locate. They’re also forced to build a fence around the farm to keep the triffids out. All the while they wait and hope other people have survived the disaster. The triffids dominate the book. They start out as a nuisance and rapidly become self-aware monsters. Any sort of human movement will attract a triffid and any human enclosure becomes besieged by them. And the plants learn; whatever method is used to exterminate the triffids soon becomes ineffectual. Day of the Triffids has been filmed at least three times.